It’s almost hard to believe that Curtis Gerry’s first Pro Series win at Beech Ridge came just a few short weeks ago. The 2016 Pro Series champion is living proof that wins don’t necessarily win you championships, consistency does. 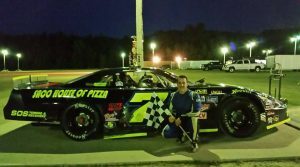 Consistency on the track is something that Curtis Gerry and his team have nailed down, seeing that the #7 is a constant figure at the front of the pack week in & week out at Beech Ridge Motor Speedway. Gerry, a seasoned veteran that’s been racing since the late 80’s, isn’t slowing down anytime soon. He’s fresh off the 2016 championship season and is already looking for another one, hoping to see more checkered flags in his near future. After accomplishing a victory on the biggest stage at Beech Ridge, Gerry would like to take his success one step further, on the PASS level. His main goal this season is to win back-to-back championships of course, but he wants to show that his #7 car can succeed in a class with touring drivers. “We got disqualified from our last PASS race…for redemption, that’s one of my next goals, to win a PASS race.” he says. The redemption song is something that Gerry seems to know well, seeing that his win earlier this year was redemption for the Pro Series 125 the week prior, where he dominated the race only to have his night end early due to a part failure. When he describes the feeling of winning a race, Gerry says that he feels more relieved than anything. “It’s just a relief, you know, finally it just came to us…we’ve been right there so many times…last week we would have had it hands-down, and something freakish like that happens; we’ve just been so close so many times.” he says, talking about how he’s come so close to victory in the past without securing it. The relief is in knowing that the hard work of he and his crew has finally paid off in a big way. Gerry may be a wheelman himself, but he still draws inspiration from other drivers. Gerry’s biggest racing influence isn’t someone that we see on TV every day. He says, “My Dad is definitely my biggest influence because he raced my whole life when I was a kid. You know, watching him grow up racing influenced me to do the same.” You could say that the urge to race has been there from the beginning for Curtis. He also enjoys watching drivers in the big leagues battling it out for championships, like Kyle Busch and Jimmie Johnson. He says he doesn’t necessarily have a “favorite” driver, but Kyle Busch is one of his favorites to watch. Gerry draws influence from not only his father, but from his big support system that he brings with him to every race. Among his support system are his Mom, Dad, his son Curtis, his spotter Jason Thompson and his family, his girlfriend Jehn, among others. “They’re all just huge supporters of me, and I honestly couldn’t do it without them.”, he says. He also says that all of his sponsors, which include Downeast Deals, Saco House of Pizza, Structural Woodworking and others, play a big role in his success as well. Gerry’s success has spanned over years of racing in various divisions throughout Maine. Curtis began his racing career in 1988, racing Modifieds. He later moved into Late Models and has only grown from there. When talking about his experiences, Gerry says that he grew fond of Modifieds, saying, “It was so long ago, but I really like Modifieds. But, I’m having such a blast in this division though.”, he says, relaying back to the fact that he’s having the time of his life racing in the Pro Series right now. When it comes to his favorite moment of his racing career so far, Gerry has no hesitation about what it is. “Oh, my favorite memory would be the championship, by far. To win the track championship and the state of Maine championship…that was just huge.” he says, talking of his successes last season. Although Curtis Gerry has displayed dominance on the race track year after year, he still maintains a career outside of racing. Gerry is the owner and manager of Downeast Auto, Inc. in Waterboro, a used car dealership. In addition to running his business, he likes to travel when he can, go fishing when he has the chance to and, much like anyone else, going on vacation is one of his favorite things to do. During the winter months, Curtis likes to take to the open fields on his snowmobile, enjoying the Maine winters. In the end, he says that he “loves racing” and it is by far one of his favorite things in life. Over the years, he has received a lot of advice from different drivers, but it’s the little things that matter. Curtis says that he has received a lot of positive thoughts from people at the race track, whether that be his fellow competitors or fans. “Just recently, most people just said ‘Keep up the good work’…everyone I know tells me that I just need to keep doing what I’m doing, so that’s awesome to hear.” he says, speaking of the positive encouragement he’s received over the course of the season. Gerry’s a veteran in his own right, racing alongside young guns like Reid Lanpher and Garrett Hall; both of which Gerry finds himself competing with every week. “Reid is a young kid and a great race car driver…I really like racing against him.” he says, going on to praise both Reid and Garrett for their clean racing on the track. In addition to respecting his competitors, Gerry has a lot of respect and admiration for his home track. “I really love Beech Ridge, and I love Saturday night races. But, I love longer races.” he says, telling me about how he loves the 250, but didn’t race in the 250 last year because he didn’t want to take a chance on damaging his car while he was contending for the championship. Winning races is obviously important, but winning isn’t everything, he says. There are so many young children that attend the races, and Gerry, like others, makes sure that a trip to the race track is a good experience for the kids. Curtis is always equipped with hero cards to give out to the kids, giving them something to commemorate their race experience with. He also makes sure that he has candy for the Autograph Night sessions, which makes every experience that much more worthwhile for a young kid. He loves fan interaction and having fans wanting to take pictures with both him and his car, which he always agrees to. “It’s all about just being there for them.”, he says. As far as his advice for young kids trying to make it in the racing world? Curtis says that it’s important to smart small and work your way up from there. “Pick a division to start out in that you can be successful in, but don’t jump up too fast.” he says, saying that moving up too fast too soon can hurt you in the long run. Curtis Gerry is not only a race car driver, he’s a family man and a businessman as well. Not only is he successful both on-track and off-track, he has an optimistic attitude and winning mentality that will never fade. Even at the top of his game, he’s still looking to reach new heights and continue his dominance at the front of the pack. His drive for success could potentially lead him to his 2nd consecutive championship, but we’ll just have to wait and find out.